"You could have made millions off it if you just got in early. And that's exactly what I wanted to do. Get in. I didn't want to be an innovator. I just wanted to make the quick, easy buck. I just wanted in. The Notorious BIG put it best: 'You're either slingin' crack rock, or you got a wicked jump shot.' Nobody wants to work for it anymore. There's no honor in taking that after-school job at Mickey-Dee's. The honor's in the dollar, kid. So in the whiteboy way of slingin' crack rock, I became a stockbroker." Watching Boiler Room I was reminded why I love movies. The film is truly what every film should aspire to be, heartfelt and touching on matters of family and love and work at one moment, yet unflinchingly brutal and truthful in the next. While most films give a small look at either a personal life or a professional life and never both, Boiler Room handles both with ease and proves itself as one of the best films of the year. There is not much out there today that is as hot as the stock market. Everyone wants in, and looking to pay the way for their kids' college or for a new Lexus tends to be the reason. But for every person who bought Intel at 6 there is another who bought stock in a '.com' too high, only to see their money disappear as quickly as the site did. Everyone sees the lure of the quick money, but no one ever sees the loss and the related potentialities that come along with it. The lure of money is what attracts Seth Davis (Ribisi) to J.T. Marlin, a "boiler room" brokerage firm located on Long Island, far, far from Wall Street. A 19-year-old college drop out, Seth is running a small-time illegal casino out of his apartment—a business that his dad (Rifkin), a New York City Federal Court judge, disapproves of. So, in an attempt to please his father, Seth joins J.T. Marlin as a trainee. But, even as he trains to become a millionaire, he suspects that everything may not be as it seems. When he realizes that he is cheating hard-working family men out of their life's savings just to earn him a few thousand dollars in commissions, guilt and the FBI quickly come calling. I recently learned that director Ben Younger interviewed for a job at a real life boiler room as well as spent countless hours speaking to brokers who provided him with as much information as he needed. That detail is what makes the film work. It feels as though the viewer is being let inside the world of high risk selling, giving the film an almost real life quality. Scenes outside of the firm, such as Seth's relationship with Abbie (Long), are handled well enough. But the scenes involving Seth's father (Rifkin) give the film a much-needed emotional center. Watching the scenes between Rifkin and Ribisi are akin to watching an acting class. The subtle nuances of a father and son trying to rebuild a relationship are displayed and I know at least one friend who felt that the scenes hit very close to home. This is the first film for writer and director Younger and it is as fine a first film as I believe I have ever seen. Younger has a smooth and natural way with his dialogue and it shows in many of the scenes. The late Gene Siskel once said that he knew he was enjoying a film when he believed he could actually sit down and have a conversation with any of the characters in real life. I would gladly sit down for hours with anyone portrayed in this film. For Younger his direction reveals a few flaws. Most of these involve little moments such as a conversation being cut with too many close-ups, or the pacing of a pivotal scene. The biggest flaw in the film is its ending. There have been many theories as to why the ending had been changed from the version that is also included on the DVD to the ending shown in the film as it stands. Some have said that test screenings had shown the need for a different ending, and others report that it was Younger's decision. Whatever the reason, the ending does hamper the film slightly, and I would have liked to have known why. The cast is comprised of mostly younger, unknown actors that are uniformly perfect. Ribisi plays Seth with just the right amount cockiness and insecurity. It is a fine performance, and I expect big things of him. The supporting cast is comprised of Scott Caan, Nicky Catt, Nia Long, and Jamie Kennedy who work well with what they are given. But the two stars of this film are Vin Diesel and Ben Affleck. Diesel (Saving Private Ryan), almost walks off with the film as Chris, Seth's one true friend at the firm. Affleck steals his scenes in a turn reminiscent of Alec Baldwin in Glengary Glenn Ross. My friends from work and I have found a virtual anthem in Boiler Room. 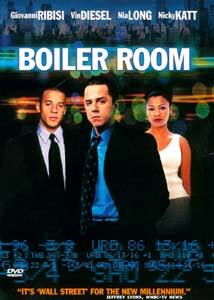 Much as the characters in the film quote Wall Street, we have taken to Boiler Room as a film that defines our profession. One in a sales career can only watch Glengary Glenn Ross so many times before it grows tiresome, and while that film is still the king, there might well be a new champ on the way up. It has become a rule around my house that if the disc carries a New Line label I need not worry about critiquing the image. The 1.85:1 anamorphic transfer on Boiler Room backs that policy up. While I noticed slight grain in certain scenes, my girlfriend observed that it is probably intentional, and the more I looked I do believe that she is right. The neon of the bars in the film is handled well, as are the black levels. All in all a very solid transfer from the folks at New Line. The Dolby Digital 5.1 and Dolby 2.0 tracks offered on the disc are fairly uneventful. The 5.1 track does have nice moments of panning and surround activity. Check out the opening title scene with the ticker going by for a nice surround demo. Bass from the largely HipHop score is tight and even, and utilized for ambiance with occasional kick in to the surrounds. No alternate language or subtitles outside of English are offered. While Boiler Room is not a New Line Platinum Series disc (but Next Friday is????) it does contain some worthwhile extras. While not exactly a screen-specific commentary, it gets the job done. Ribisi introduces the chat and occasionally chimes in with a thought or two on the acting process and thoughts about his character. Younger and producer Jennifer Todd seem to have a nice rapport and bounce thoughts off of each other easily, while having interesting things to say. Above all the most important thing to be learned from the track is that both Todd and Younger liked the latest CD by former Soundgarden lead singer Chris Cornell—a personal favorite of mine. This is a very nice track for anyone with an interest in music. The track covers everything from the use of HipHop in the film to how The Angel chose some of the music. Very good. While there is really nothing here in the way of cut scenes there are a few throwaway moments in each that deserve a look. The alternate ending included sparked much talk at my house and I am sure it has with anyone who has seen it. I would personally have preferred an entirely different ending than either that is included. Both seem rushed and inappropriate. Cast and Crew bios are available as is the original trailer in 1.85:1 and DD5.1 sound. DVD-ROM features are also provided, but will not work with a Mac. I have shown Boiler Room to upwards of 15 friends, and as of yet not one person has told me they didn't like it. Buy it, if ya can't buy it rent it, if ya can't rent it steal it. It IS that good.